demonstration to take place outside the terminal, was rejected. stay uncommented during the coming days. 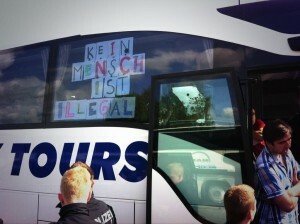 and one from Hamburg on their way to the Blockupy Action-days in Frankfurt. to transfer to trains, a group of refugees returned to Berlin. and for a free journey to the Blockupy- Actiondays.